We love Kickstarter almost as much as our morning Cup of Jo so upon discovering this heartwarming project by Chicago Design Museum’s Founder and Executive Director Tanner Woodford we just had to share with our readers in hopes we could help bring it to life. My personal affection for handwritten notes and helping save this lost art is also a motivating factor for supporting this special cause. Over the past year, Tanner has sent hundreds of letters to a variety of people across all walks of life. In it, he kindly asks the recipient to answer a broad question that traces back to the medium on which it was sent. Responses poured in. Each was more interesting and profound than the previous, expressing its author’s heartfelt, authentic and captivating thoughts through their handwriting. While the individual letters are fascinating, the sum of the portfolio is greater than its parts. In an era of constant distractions, the process of writing a letter by hand serves as a reminder to breathe, and to be in the moment. Writing an answer to a thoughtful question promotes reflection. The book of 50 letters is the first edition. It’s published by ChiDM, created by its executive director Tanner Woodford, edited by Christopher Jobson of Colossal, with a project video by Bowie. Thank you to Kickstarter for helping projects like this exist and please click on this link to help bring to life! 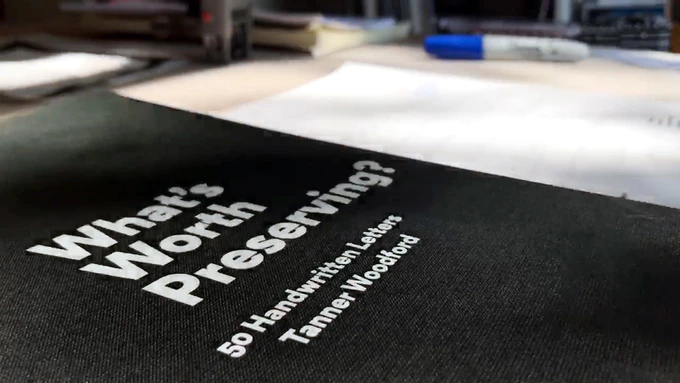 People who have answered “What’s worth preserving?” in their handwriting so far. The first response came from Dave Eggers of McSweeney’s and 826 Valencia, who suggested “it’s worth preserving the knowledge that good design comes from good designers (not robots)” on a custom, hand-drawn letterhead. Proceeds from sales of this book support ChiDM, a 501c3 non-profit organization that strengthens design culture and builds community. For ChiDM, the book is a critical step in a broader effort to promote cultural discourse, preserving ideas alongside those that have them. Primary Technologies is located in Oakville, Ontario Canada. We specialize in Website Design, Web Hosting, App Development (Apple and Android) and Custom Application Development.